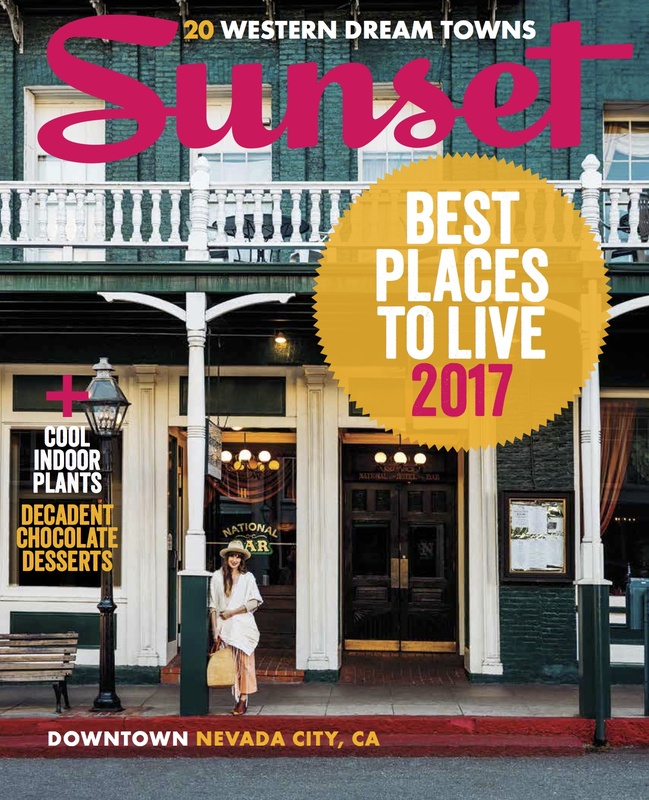 Famed historic hotel, The National Hotel, has been acquired by The National Exchange Hotel Company and will be the launch of the brands’ flagship location in Nevada City, CA, which has been named one of the “20 Best Towns to Live” (Sunset Magazine) and boasts one of “The Best Main Streets in America”(Architectural Digest). Deal represented by Jon Blinder and Tyson Tucker of Coldwell Banker Grass Roots Realty, Commercial Division. The National Hotel is a historically registered, 40 room property with pool and fully operational restaurant. 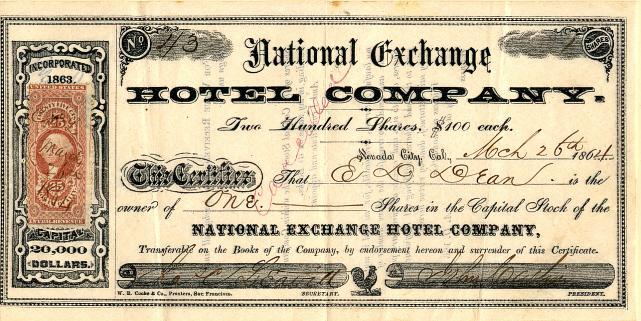 The National is said to be the oldest continuously operating hotel in California (and west of the Rockies), it opened in August 1856 under the name of “Bicknell Block”. Located in Nevada City, it was built in stages between 1854-57, and is the site of meetings that led to the formation of the Pacific Gas & Electric Company (PG&E). Famous guests include Mark Twain, Black Bart, Jack London, Lola Montez, Emma Nevada, multiple United States Presidents; Grover Cleveland, James Garfield, Ulysses S. Grant, Benjamin Harrison, and Herbert Hoover. The National Hotel is listed in the National Register of Historic Places, as State of California Historical Landmark #899. Multiple plaques detail the significance of the property, including one in the hotel parking lot that is dedicated to the town’s one-time red light district and its unique contribution to the California Gold Rush. Fife is the son and grandson of former Nevada County residents and had even met his wife (a former resident as well) in this quaint town. The “acclaimed designer,” (Design Milk) Jordan Fife, intends to breathe new life to the National Hotel following a major renovation of the historic site in the heart of downtown Nevada City, creating stunning indoor/outdoor spaces inspired by the hip and grand Victorian properties of New York and San Francisco. Upon completing a multimillion-­dollar re‐envisioning by Fife and his team, the exclusive hotel will become Nevada City’s only mid-luxury boutique hotel. Returning the hotel’s name to its originally calling, The National Exchange Hotel will offer guests a unique experience of rejuvenation, cutting edge design, and serenity with the beautiful grand Sierra Nevadas as a backdrop. The hotel, while being fully renovated, will still maintain its historic and intimate feel. Part of the fabric of the hotel is the local color and the staff, “we invite all former staff back who seek a roll in the relaunch of this towns landmark,” says Fife. Featuring Frette Linens, claw foot baths, and a mix of bespoke and high-­end vintage furniture, The National Exchange Hotel hopes to set a standard last seen in Nevada City under former ownership of the Rector Bros in the early 1900’s. This once again, is an iconic property in the making. Fife plans to rebuild using the signature hip and modern details he has become well known for in California. After designing homes like the Tim Palen Shipping Container House in Joshua Tree, he has brought his rustic, modern sensibilities into the hotel industry with the famed L’Horizon Resort and Spa, SO•PA Restaurant, and Smithy. As designer and property owner, Fife is proud to launch The National Exchange Hotel as the first hotel of his newly launched brand, National Exchange Hotel Company. He continues, “The National is this perfect little jewel in this monolithic brick structure. It’s iconic and well-­‐preserved architecture, along with its rich history make it completely unique. There is nothing else like it.” The National will be designed to reflect the original Victorian style with modern influences. The feeling will be 1920’s gentleman’s club with tufted leather, oil paintings, built in bookcases with rolling ladders, and slightly ominous feel as a nod to the hotels haunted past. Additionally, The National Bar will relaunch with the hotel and will introduce new cocktails inspired by the changing seasons, joining the current menu of classic favorites and will retain its original allure and charm that have made it a staple among locals. The bar and lounge will host live music from some of the nations top bands and weekly events. “We are very proud of our events program and can’t wait to show the locals all the fun things we have planned,” said Fife. The National Exchange Hotel Company scours America for interesting, historic, or architecturally-significant properties that can be re-purposed or re-positioned. We look for anything from motor lodges, historic hotels and buildings, post offices, schools, eye-catching structures, to open land with unique natural and geological attributes. Having our work identified as some of the best design in the world (Conde Nast, Architectural Digest, Travel and Leisure) and having won many hospitality design awards (HD Awards Best Luxury Hotel Design), we are fortunate to say we do all our design in-house and have tapped talent from every industry to contribute such as famed artist Dr. Woo, who will oversees all art curation and culture. We believe even a beautifully designed property is only as good as its staff and training. It’s the cultivated moments and easter-eggs that bring the property to life. Having some of the best operators in the business, we strive to understand and predict our guests’ needs and wants. We own and operate all our own properties post-development. Managing partner Jordan Fifes’ work was one of the top three recognized by HD Design Awards for best luxury hotel design in the world. To date Jordan has built, and repositioned over 7 properties. These properties include award winning hotels and restaurants. Fifes’ most recent hotel projects have been named one of the “50 best new hotels in the world” by Travel and Leisure, one of the “100 best hotels in the world” by TATLER Magazine, “favorite new American Hotel” in 2015 by Architectural Digest, “top 3 best luxury hotel design” by the Hospitality Design Awards, and was accepted into the prestigious Leading Hotels of The World. Most recently the hotel was named to the “Best 100 New Hotels in the World 2016” and 2017 Hot List by Condé Nast Traveler, and to the most lauded list, the Conde Nast Travelers’ Readers Choice Awards stating L’Horizon as #1 Best Resort in California- #2 Best Resort in the United States and #8 Best Resort in the World two years in a row. L’Horizon’s Michelin Star helmed restaurant SO-PA, has been named the number one restaurant in the Coachella Valley as well. Both the hotel and restaurant have been featured in hundreds of magazines, won multiple awards, and have achieved massive financial success. 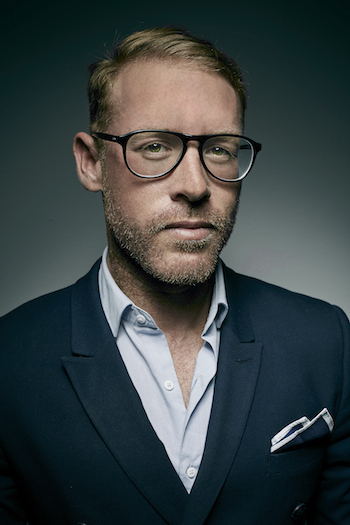 Jordan Fife was recently recognized by Angelino Magazine in their 2017 September issue of Power Players as “Power Player- Field of Hotel Development” and “Top Celebrity Designer” by Design Milk. The best news this City has had in 30 years. The next will be the selling and renovation of the Poster Palace ( Alpha Building). Congratulations to the Group and the best of Luck on the remodel. Hooray for the return of a Native Son to rebuild the Spirit of NC, with few more native sons/daughters who have accomplished success in the the other world we will experience another Gold Rush. Will it be possible that the pasty will become one of the new food experiences for the Culinary World ? When I was growing up in the Upper Peninsula of Michigan, another home of the pasty, I found an old English crust recipe to enclose the pasty . I serve the new pasty at a party of my peers with the traditional filling, needles to say, they had a culinary experience with a very traditional filling . I hope someone hires Bruce the bartender, he’s kind of a classic. I will also miss the very charming Chester at the keyboard and accordion, unless he is available for private engagements. Looks like the new owner has some great ideas for the restoration and remodel of the National. Clever of him to keep two rooms open during the work, so that the hotel can keep its designation as the longest continuously operating hotel in the state. This is great news! I want to work there!!! Yes, I’ve enjoyed my exchanges with Jordan as this story unfolded. Glad he’s willing to invest in the town. Maybe he could buy the Holbrooke too! Escrow had closed on this deal. Congratulations to all those involved!